Get your horse to quit prancing, pawing, and moving around! Putting on new shoes requires an obedient horse. You can make your farrier’s job a whole lot easier by having a well-behaved horse. Not only is it frustrating, but it can be dangerous when your horse moves around during a trim or shoeing. Don’t worry, you can improve your horse’s manners with a little bit of training and persistence. 1. 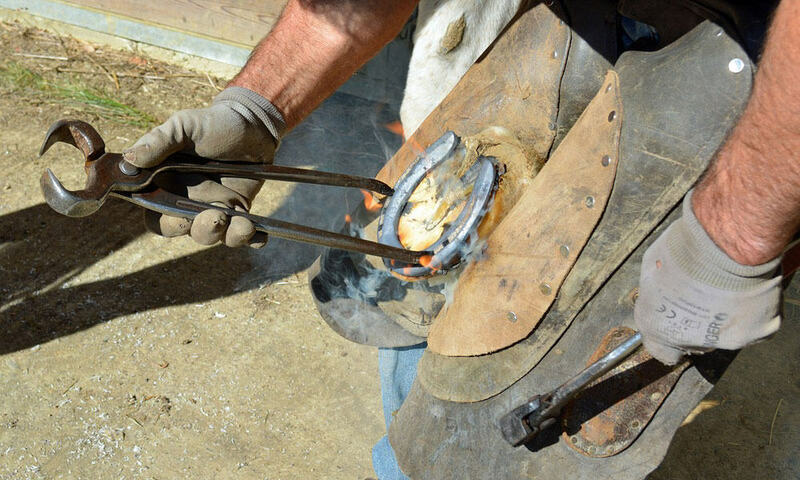 Watch how your farrier lifts and holds your horse’s hooves. You can even ask them to show you. Now, it’s your job to practice holding their foot in the same way. Each time you go to the barn or pick out their hooves, hold their feet like your farrier does. Take your time and increase how long you hold each hoof. 2. Next, ask your farrier for a dull rasp. At this point, your horse should stand patiently as you hold their hooves. Gently run the dull rasp over their feet, much like your farrier does. Repeated exposure to the rasp will prepare them for the actual visit. 3. Lastly, practice with a small hammer if your horse wears shoes. Lift and hold the hoof, as your farrier does, and gently tap the foot. Expect more patience over time. You’ll have a better behaved horse in no time, and your farrier will be much happier!